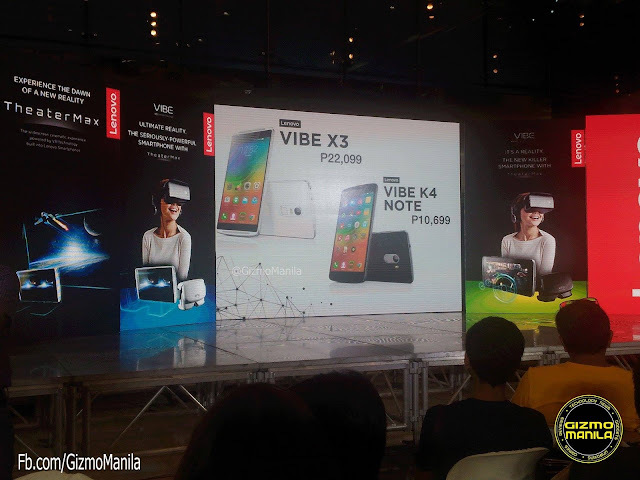 Lenovo launches 2 new devices Vibe X3 and Vibe K4 note smartphone together with the unveiling of the newest Lenovo technology, Lenovo TheaterMax. With TheaterMax user can now enjoy viewing with its widescreen cinematic vivid colors and immersive sound quality in the palm of the hand. It also boost smooth graphics and responsive 3D gameplay. Gizmo Manila Lenovo TheaterMax event Gallery. Lenovo Vibe K4 Note features a vibrant 5.5” Full HD display with a wide viewing angle of 170 degrees and 1080p clarity. It also boost it hardware with 64-bit MediaTekMT6753 Octacore Processor,3GB RAM and 16GB ROM which is expandable up to 144GB via MicroSD. It also equipped with Fingerprint sensor, twin front ported stereo speaker which enabled by Dolby Atmos. Take good quality photos with 13MP REAR Camera and 5MP Front Camera. You can enjoy Lenovo Vibe K4 Note with FREE VR Headset, Screen Protector and Case at P10,699 nationwide. It’s available in color’s Matte Black and Matte White. Meanwhile the Lenovo Vibe X3 smartphone packed with 5.5” Full HD display, 64bit Qualcomm Snapdragon 808 Hexa-Core Processor, 3GB RAM/32GB ROM it isexpandable via SIM2 Slot. One of the best part of Vibe X3 is its camera, having a 21MP Rear camera with stunning 4K Ultra HD video recording and 8MP front for selfie. It’s Perfect for travel and adventures specially this summer. Vibe X3 is available on Pearl White color and now selling nationwide at P22,099. It also comes with FREE VR Headset, Screen Protector and Phone Case.
. K4 Note and Vibe X3 is running on Android 5.1 Lollipop which is soon available for an update to Android M by May 2016.